After a crappy week I decided I needed to treat myself and was due for some new beauty products. When I was younger I would always go to the body shop. They have the most amazing body butters and the cream was perfect for my sensitive skin. Along the years I stopped going, but took a little trip there the other day and bought a few things! My love for The Body Shop is back and I will definitely be going back for more. All I have been hearing about is this new BB cream. It apparently does wonders to your face and has everything in one. I was going through a magazine and it listed the top 10 best BB creams. The Body Shop was one of them and was the cheapest so I decided to give it a go. Completely love it, seriously hydrates, gives an even skin tone and a nice glow to your face. Only negative is it did have a little bit of a bronzer finish to it but with a blend of blush it was completely fine. I also am the whitest person possible so that could be another reason. I also went to Shoppers the other night and bought some necessities (eyeliner, mascara) and then grabbed some new Smashbox lipstick and a sweet bracelet. The new sections of Shoppers has the up scale, more expensive makeup plus some jewellery, bags etc. Who knew shoppers sold jewelry? Well lucky for me I was seriously taking my time and came across this spiked bracelet. I've wanted one for so long but the ones I find look cheap. This one is by Cocoa Jewelry which is a Canadian company!! 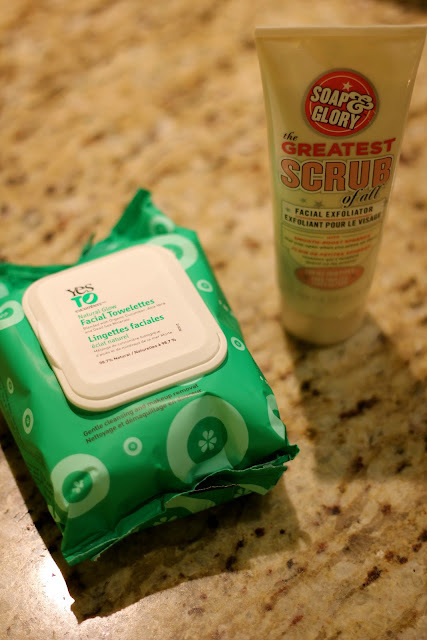 I've been wanting to try the soap & glory scrub! i will probably get it sometime soon, let me know how it works!